How do we copy text displayed on webpage opened on computer to a smart phone? Generally we don’t copy text and instead manually type the text displayed on computer screen using on-screen keyboard on the smart phone. We can easily get rid of this manual typing routine and copy text directly from webpage to mobile phone by scanning QR code the same. Sounds confusing? read on to get clarity on this quick method of copying text on the phone. 1. 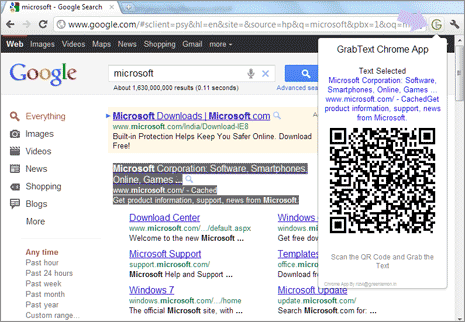 Launch Google Chrome and open GrabText extension webpage. Click Add to Chrome to download and install this extension. 2. Then open any webpage from where you want to copy the text. Select the text using mouse and then click Grabtext icon on the menu bar located at top right part in the Google Chrome window. 3. It will display the copied text and the associated QR code. Using camera on your smart phone, scan the displayed QR code for quick and instant transfer and copying of the selected text. For sure one handy and very efficient way of using QR technology and smart phone for quick grab and copy of text anytime. It saves lot of time, as there is no manual typing involved – what say? You can also use QR code technique for copying other types of content on the internet. For example: copy bit.ly urls with qr code and even generate qr code for Google Maps urls for quicker navigation to specific Google Maps location on your smart phone. This app is really a great time saver. Kudoos!